Back in early December, Limpd received an email from Master of Malt announcing their 2012 Whisky Advent Calendar. Since Limpd’s Pappy is a fan of the brown spirits, he decided to purchase the Whisky Advent Calendar as an early Christmas present for him. While Limpd’s Pappy is a fan of most brown spirits, he has been known to turn his nose up at a dram if it has even the slightest whiff of smoke. 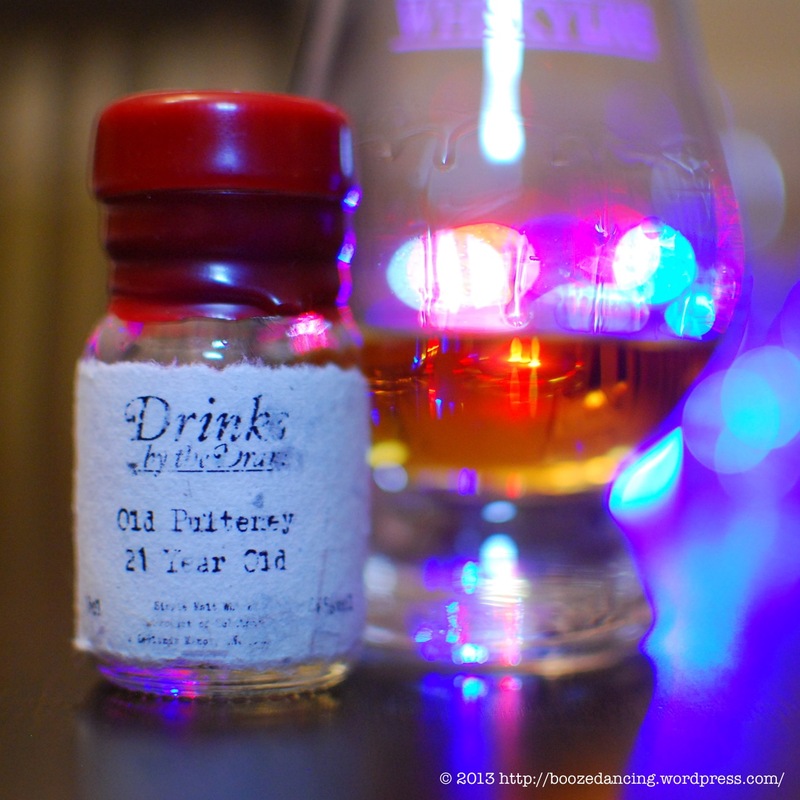 Since this sample of the Old Pulteney 21 Year Old eventually found its way to one of my whisky hiding places (along with several other wee drams), I can only assume that Limpd’s Pappy found the aromas in this whisky to be not to his liking. Scoring a record-equalling 97.5 points out of 100, it is only the third time that a single malt has ever won the prestigious award, and we are just the second Scottish distillery to do so. Aroma: If there’s such as a thing as Salt Water Caramel, then this would definitely be it. The maritime influence is readily apparent, but with a definite caramel backbone. Also getting some ginger, cardamon, fresh fennel, and just a hint of pipe tobacco. Taste: Lightly oily mouthfeel. Cinnamon and white pepper heat at the onset with a touch of that saltiness coming through. At mid-palate, that caramel sweetness makes an appearance. It all comes together at the finish, i.e. sweet and spice, and everything nice! Warm, medium finish that lingers for a minute or two with some of that sweet pipe tobacco showing up in the aftertaste. Once again, the trouble with reviewing whisky samples rears its ugly head! I really enjoyed the Old Pulteney 21, but alas, I only had enough for just one dram. I suppose it could have been worse. I could have not tried it at all. I will definitely be on the look out for more from Old Pulteney. Nice review and photo. Glad you enjoyed the wee dram. I’ll let Pappy know that it didn’t go to waste. Thanks! It was definitely a tasty wee dram. Word on the street is that the 17 is even better. We need to do some research! I just might have some time to scout it out in KC. Let’s see if the shelves have anything different than in So. NJ. I’m thinking you might be able to get your hands on some Kentucky Whisky that you can’t get here.